Portable Celtx OS X is the screenwriting & production breakdown writing tool packaged as portable application so you can take your preferences with you. Portable Celtx OS X is the screenwriting & production breakdown writing tool Celtx packaged so you can carry around with you on any portable device, USB thumb drive, iPod, portable hard drive, memory card, other portable device (also on your internal hard disk) as long as it has 65 MB of free space and use on any Mac OS X computer, taking your preferences with you. Drag the "Portable Celtx OS X" folder to your portable device, USB thumb drive, iPod, portable hard drive, memory card, other portable device (also to your internal hard disk) as long as it has 65 MB of free space. Clicking "Portable Celtx" will open Celtx from your portable device, wait a while before Celtx start. If a local copy of Celtx is running an alert window allow you to quit it. 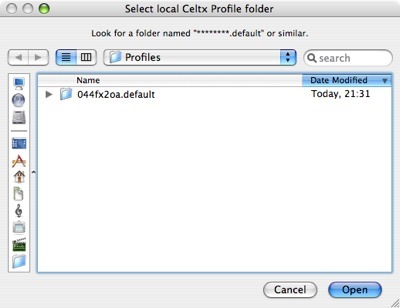 You can copy your local Profile folder to Portable Celtx when "Copy local Profile" window ask you. So, if you wish to use your bookmarks, add-ons, history, personal data and preferences you already have on your system, just click "Copy" when prompt, and select the folder "/Users/<username>/Library/Applications Support/Celtx/Profiles/.default/". Remove file "Portable Celtx.app/Contents/Resources/CopyPref_Done" to copy preferences next time you open Portable Celtx. Know issue: when you upgrade your profile, Celtx restart immediatly, this show the "Portable Celtx quit with success" popup window even if Portable Celtx is still running. Portable Celtx OS X script source code page. Portable Celtx ask to quit application already running. Portable Celtx is wrapped as application package with Platypus.